The Federation was founded on February 12, 1946, as the Tennessee Conservation League at Chattanooga’s historic Read House Hotel, where 53 outdoor writers and community leaders from around the state gathered to build a new organization to restore the integrity of all of Tennessee’s wildlife and natural resources — not just fish and game. Their goal was to establish new leadership uninfluenced by corrupt political control. Click here to read more about the birth of the Tennessee Conservation League. Over the next three years, membership grew to include several thousand individuals and affiliate organizations comprised of a diverse group of individuals — hunters, anglers, bird watchers, hikers, gardeners, and other outdoor enthusiasts with varied interests, but united by their concern and compassion for wildlife and natural resources. Tennessee Wildlife Federation also won the full support of the governor-elect and saw its model fish and game legislation passed in both the state House and Senate with overwhelming majorities. Leadership on key policy issues has been a hallmark of Tennessee Wildlife Federation throughout its history, as well as the preservation of important existing legislation. Since 1946, TWF has worked to ensure the wise and responsible use of the state’s natural resources and has found success by rallying political support among members and affiliates while working to find common ground with opponents. Tennessee Wildlife Federation has championed many successful efforts in conservation and wildlife management by maintaining high visibility on Capitol Hill, constantly monitoring proposed legislation, employing researched-based facts and serving as the voice of reason. As a result, Tennessee Wildlife Federation has been instrumental in issues regarding air pollution, water pollution, endangered species protection, forest management, resource management and other legislation that impacts Tennesseans’ opportunity to enjoy the great outdoors. This has earned the organization a seat on several state boards and advisory panels. Today,Tennessee Wildlife Federation is the collective voice of the diverse men and women working to ensure Tennessee’s great wildlife and natural resources will be enjoyed for generations to come. in the conservation movement of the 1970s and ’80s in the Winter 2014 issue of Tennessee Out-Of-Doors magazine. Click HERE! Charter members of the Tennessee Conservation League gather at the Read House in Chattanooga on Feb. 12, 1946. Seated, left to right: Lou Williams, Walter Amann Jr., Paul K. Bryant, and Z. Cartter Patten III. 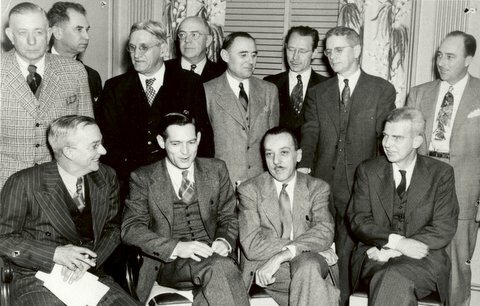 Standing, left to right: Nash Buckingham, Nat Winston Sr., E.H. Peckinpaugh, Charles J. Murphy, Major B. Harris, Joseph Halburnt, Clifford Curry, and Kyle Walker. Not pictured: John Flippen, Enoch Brown, and Frank Vestal.